After I got my first computer in 2000, it didn’t take very long for me to experience the sting of data loss. An external hard drive I was using at the time (16 gigabytes – I couldn’t fathom ever filling it), stopped working and all the files proceeded to float into the empty void that is Failed Hard Drive Purgatory. Of course, at age 15 the data I had certainly wasn’t very valuable, but I didn’t like it being taken away from me like that. Since then, I’ve always been very careful to backup my data as diligently as possible. How frequently and what methods one uses to backup seems to be a popular topic among computeroids. Special hardware and software is marketed to these groups to satiate every possible disaster aversion plan. As such, the less tech-inclined seem to think backing up is some mystical procedure that requires a lot of money and technical know-how. When really, all most people need to do is have two copies of everything! If you burned a copy of your resume to a CD, then congratulations, you just made a bona fide backup. File that sucker away and pat yourself on the back. In the last 12 years, my data has changed. Some are still worthless files I could stand to lose. Some are synchronized with cloud services which have cropped up in recent years. Some are irreplaceable, like the gigabytes of photos I’ve shot in the past decade. Some are important documents, like invoices, tax forms and other “grown-up” annoyances that I increasingly find myself dealing with. But whatever the file, the thought of losing any of it is depressing and maybe even a little painful. High capacity hard drives, online services and even optical media are all so affordable that there’s very little excuse not to have – at minimum – two copies of all your data. My primary machine for the past 7 years has been a first generation Mac Pro. It’s been a great machine and provides lots of flexibility with four bays for hard drives and two for optical drives. But even if I had an iMac or a laptop, my solutions would work just as well using external drives – perhaps even better since external drives are much easier to move around and replace. I’ve always liked keeping everything I use contained on one primary drive – it makes backing up that much easier. Luckily disk technology has grown fast enough to keep pace with my growing needs (or perhaps my needs keep pace with technology? Hmmm). I always have two backup drives in my tower – each the same size as the primary drive. The first backup drive uses the software SuperDuper! to quickly synchronize with the primary. This is done every other night automatically. The other drive is setup to use Apple’s Time Machine system. These two backup solutions cost me less than $30 to set up (not counting the cost of the hardware, but I think that’s a given – plus, you could skip the paid license for SuperDuper! if you don’t need all the paid features). Both of these pieces of software provide different types of backup, which is important to me. Should something happen to an inpidual file or folder, I know I can count on Time Machine to have a version saved on my second backup drive. If something more catastrophic were to occur to the entire primary hard drive, I can then simply reboot using the SuperDuper backup and be no more than 48 hours out of date. It’s very reassuring. But what if something were to happen to my entire computer, like a fire? Well, offsite backup can protect against that, but it’s often tricky, slow, or expensive (usually some combination of two of those three). I attempted to use an Amazon S3 solution for a short time, and while I felt some cool geek cred associated with it, it was ultimately difficult to use and unnecessarily expensive. It’s reassuring to see so many online backup companies putting their hat in the ring, if only because it’ll encourage more people to protect their data. Unfortunately, the thought of sending upwards of 2TB of data over my poor cable modem is unappealing. If you have just a few documents and photos, then online backup is probably a great solution. What I ended up doing was decidedly low-tech, but it provides me with good peace of mind. I waited for a good deal on external drives, picked up a few and filled them with all my data (again, using SuperDuper!). I then FedEx’d them to some friends and family who had agreed to store them for me. Does this sound paranoid? Insane? Perhaps. But in my mind I was able to protect my data for about $150 and a few beers next time I visit my friends and family. Should anything truly awful ever happen to my computer, I know my photos, my music, my movies and everything else I’ve spent over a decade acquiring is safe. It’s just my way of providing insurance for my digital possessions – much of which is irreplaceable. I have other data that needs tending to as well. I have a media center with home videos, photos and plenty of iTunes purchases that I have no intention of losing. That system has its own independent backup scheme which, while not as thorough as my main computer, is no less important to have. I also have a work computer whose backups are my own responsibly. That system is more about rotating data to different storage formats as the data gets older. It starts with the production hard drive, then as projects age and more space is needed, they are moved (manually) to one of two overflow hard drives, as well as burned to either DVD or Blu-Ray for long term storage. While I've never found optical media necessary for my home backup, it's often a very good option for many users, but the key is organization. Nothing is worse than looking at a generic silver DVD with "May 2009 backup" scrawled across it, offering no real hint at its contents. The optical storage at work is cataloged using CDFinder and given a serial number to make the over 1200 discs easy to search through – this goes a long way to preventing such confusion. The second half of the equation. Failure will happen. Backup is often touted as something you’ll be glad you have if your hard drive fails. In reality it’s something you’ll be glad you have when your hard drive fails. So while having a backup of your data is nice, you always need to have your eye to the future of your hardware. For the rest of our lives, we’re now going to be playing a never ending game of staying in front of hardware failure. Backups are a good solution if you experience a problem and need to recover, but the best solution is to stay ahead of the failure. The moment I begin to notice my hard drives beginning to age (glitchy file copies, S.M.A.R.T. status failing, slow r/w times), I begin looking for good deals on a new drive. Perhaps someday we’ll have flawless SSDs which have 0% failure over 90 year lifetimes, but we’re not there yet, not by a longshot. So for now, we’re always going to be in a race against data loss. I got to see my very first 3D film when I was 10 or 11 years old. It was an IMAX movie called Across The Sea of Time; it fell in line with most IMAX features of the day as being "educational" first and "entertaining" second (I put both those in quotes because, really, it was neither). At the time, 3D – like IMAX – was nothing more than a novelty, so they were a perfect match for each other. The movie was less than an hour long and told the story of immigration to Ellis Island through the eyes of a young boy. Of course, it included a litany of novelty shots that such as sweeping panoramas of New York and items popping out at you. If I'm remembering correctly, they also had archival stereoscopic pictures that they merged together to show on the screen...if there was any saving grace of the movie, that was it. The technology being used at the time was an expensive shutter glasses system. It's a rather ingenious solution in-which the film is played at twice the normal frame rate with each alternating frame being for either the left or right eye. The oversized eyewear communicated with the projector & screen through an IR receiver. This allowed them to sync up and shut off each eye for a fraction of a second (presumably 1/12th?) to allow the other one to see the appropriate image. You never felt like more of a dork than when you wore these helmet-like glasses. But it worked, and it gave people a good idea of what new 3D technology could do – especially since most people still associated 3D with the old red and blue cardboard glasses. However like I said 3D was just a novelty, like IMAX itself. It was expensive (both from a production and a ticket price standpoint), and much like sound in the early 1920's, still in its infancy. But it was pretty clear that if these hurdles could be overcome then there would certainly be a place for it in the future of cinema. When you think about it 3D films were like the flying cars of cinema technology – nobody knew how or when it would happen, but there was a general consensus that it would be an inevitability in our future. In the late 1990's few things happened…namely: DVDs, big widescreen TVs, the internet, computers, and an endless supply of cheap electronics which allowed even the poorest of college students to have a rather impressive home theater. Suddenly movies could be experienced in the home with a near theater-level quality system. Going to the theater became far less valuable, and the movie industry suffered for it. They needed a differentiator, since all that was really left was the sheer size of the screen and that wasn't going to cut it much longer. What they needed was 3D. Being the first 3D film I had seen in nearly a decade, this was also the first time I got to experience the polarized Real-D system; a technology I consider a vast improvement over the LCD shutter system (though I'm sure some would argue otherwise). Having a rudimentary understanding of how light works, I was really impressed with the ingenuity of this system. Also, as someone who wears glasses beneath the 3D ones, it was nice to have something smaller than a motorcycle helmet to put on. Finally, whereas the IMAX shutter system came along with ushers screaming at you to return the $100+ glasses, all you get with Real-D is a friendly request to recycle. All-in-all, an improvement in my eyes. The Nightmare Before Christmas has been re-released each subsequent year in 3D around Halloween, and I've been sure to catch it every time; both because it's one of my favorite childhood movies, and because the 3D version is an excellent example of how to do this sort of thing right. However, even in 2006 and 2007 the list of movies being presented in Real-D was pretty thin. It was mostly limited to CGI-animated features from Dreamworks and traditional IMAX education films. As a result, I didn't come across anymore 3D movies until Coraline was released in 2009. Watching a 3D movie is obviously a very different experience, but few people can really put their finger on why. After seeing Coraline in both 2D and 3D, it became very clear what is lost: Peripheral vision. When you watch something presented in 3D, your eyes are forced to focus on one point, and the rest of the image melts away into your periphery. This is what creates that all-engrossing experience. However, the fatal flaw here is that you begin to lose the vision and composition of the director and the cinematographer, and you also begin to lose the ancillary details that make movies like Coraline so incredible. Henry Selick is a fantastic director and Coraline, like his pervious films, has a impressive level of detail that can only really be appreciated by viewing it as a flat composition. It's a nice gimmick to be able to feel like you're in the world with these tiny characters, but I find it more impressive to experience the craftsmanship of the film from a technical perspective. 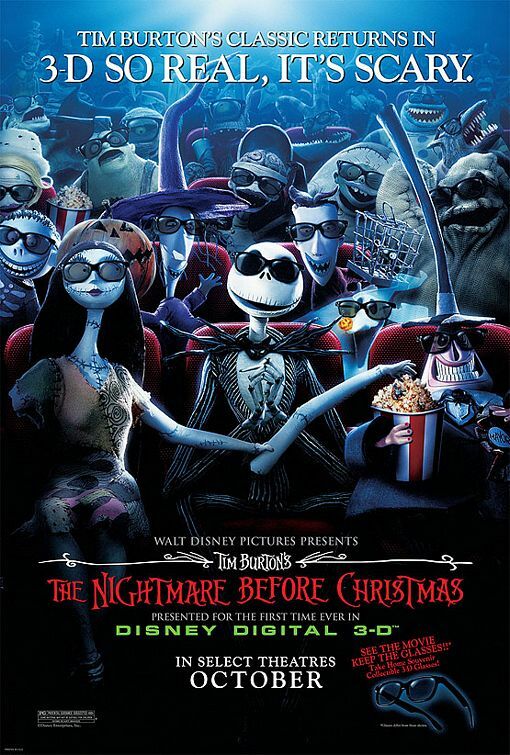 Thinking back to my original reaction to The Nightmare Before Christmas in 3D, I realized my near-encyclopedic memory of the film filled in many of the gaps that I normally would have lost had I first viewed the movie in 2006. Here's a half-assed attempt at demonstrating how perception and peripheral vision changes in 3D verses 2D. Your eyes are naturally forced to focus on one element – in this case the characters at the table. As a result your brain can't process the surrounding information, and you lose both the detail and the strong composition. This fetishizing of 3D as the ultimate cinema experience needs to stop. It's is neither a superior nor inferior way to view any one movie. If anything, it creates confusion in the marketplace as to which version to see. It shouldn't land on the consumer to have to pick which movies will benefit from the technology and which wont. 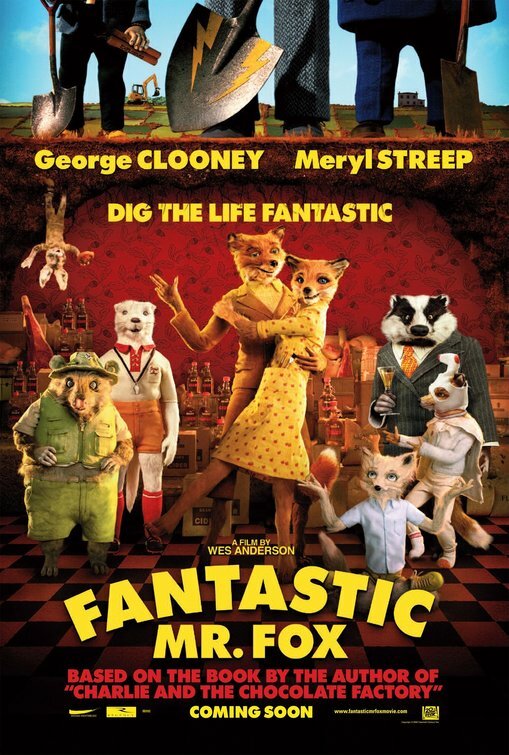 This is why I was so happy with the aforementioned The Fantastic Mr.Fox. I don't believe for a minute that Wes Anderson wasn't given the opportunity to shoot this movie in 3D...not after Coraline (Anderson had worked with Selick on The Life Aquatic With Steve Zissou...so you know the discussion happened). This was a perfect example of a director knowing what was best for his film and his vision. Perhaps this is happening more often than I'm imagining. Maybe there's a whole legion of directors who are resisting 3D technology for all-but-the-best implementations. I'd like to think this were true, but I doubt it. I had an opportunity to ask Henry Selick about his adoption of 3D when he held a fantastic Q&A a few months back. I expressed my concerns about what was lost when viewing a movie in 3D and how I felt Coraline was a far more interesting experience in 2D Without getting into direct quotes (because I really can't remember), he said that 3D was essentially the endgame in movies. It's what filmmakers had been striving for since the beginning and is the ultimate way to engross and audience. I'm sorry, Mr.Selick, but there's no way that can be true. If 3D is the best way to express visual art, then painters would have given up for sculpture long ago; photographers would have given up for laser-driven holography; and traditional animators would be all working for Pixar. The concept of a composed, 2D, framed image is as relevant and important as it's ever been. 3D works, but not for everything. To his benefit, Selick urged everyone in attendance that night to not watch the "red & blue" 3D version of his film that's included as a marketing gimmick on the DVD. I wholeheartedly agree. Watching Avatar in 3D (like most of the world has apparently done), I was once-again reminded where 3D could benefit a film. The all-engrossing experience of this movie is perfect for the technology. Pandora is a world so fantastic that presenting in 3D aided in making the experience more believable. James Cameron used 3D as storytelling tool to help drag you into this otherwise unbelievable world. Traditionally I'm not a science fiction fan, but the sheer achievement of this movie (the horrible dialog not withstanding) leads me to believe that there is a potentially bright future for 3D. I just hope it's used for good, and not evil. I'm hoping that the costs associated with shooting like this will help curtail the deluge of bad executions that surely await us. This past fall, in order to drum up some excitement for Toy Story 3, Pixar released the original two films in 3D, presented as a double-feature. Being the huge Pixar fan that I am, I went, and I enjoyed every second. Neither Toy Story movie ever felt like a compositional achievement worthy of being preserved in 2D. For me, it was more exciting to think that they had to go back to their original files from 1994 & 1998 and re-render them using 2008 technology. A few months earlier, I also saw Up in 3D. While not as successful as I had hoped, it was none-the-less an enjoyable experience. 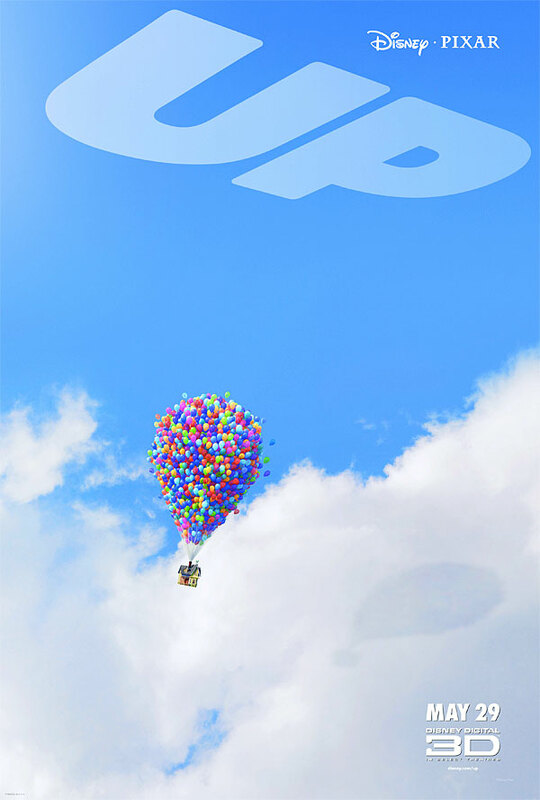 I would say Up is equally impressive in either 2D or 3D. It seems that Pixar's style, while detailed, doesn't lose much when being viewed with glasses on. Pixar to me has always been about storytelling, character design, and color theory (that's right). None of these elements change drastically when you lose your peripheral vision, so I'm cautiously optimistic when it comes to Real-D releases coming from them. This may just be another in a long line of things that they simply know how to do right. At the most recent Consumer Electronics Show in Las Vegas, the big buzzword (or words? acronym?) was 3D. 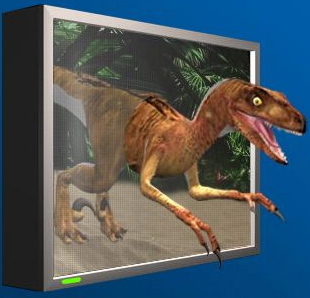 Nearly every major television manufacturer showed off a set using some sort of 3D presentation technology. Most used glasses and a DLP-based system similar to Real-D, while a select few had glasses-less systems. It's nice to see the technology being pushed forward, but I'm a firm believer that until the glasses-less systems are perfected, they'll never find their way into the house (seriously, are you going to keep 8-pairs of Billy Joel glasses on-hand and force everyone to wear them when you want to watch Law & Order?). It's taken over a decade for HD to be adopted into American homes; I can only imagine how long it's going to take before content is shot, produced, transmitted and displayed in 3D. I give it 20 years, easy. And even with all that, I'm not so sure I'm ready to kick the movie theaters in the balls that quickly. Just when they seem to have finally found a nice niche to attract people to their over-priced palaces again, the consumer electronics industry is right there, ready to pull it away and plop it in your living room. I like the theaters, and I like having a reason to go to them again. All images used in this post have been linked back to the source from-which they were derived. 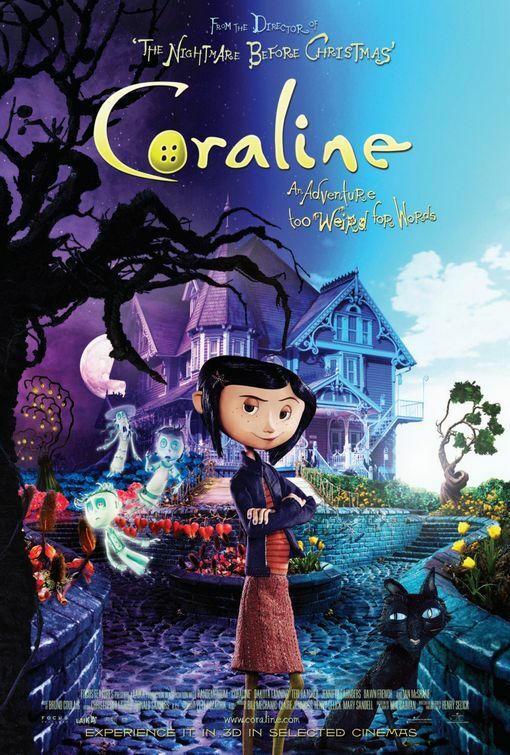 Coraline © 2009 Focus Features and Laika Entertainment. Screen shot used under fair use.